Accepted for publication 15 October 2001. Published 29 October 2001. Chastagner, G. A. 2001. Susceptibility of intermountain Douglas-fir to Rhabdocline needle cast when grown in the Pacific Northwest. Online. Plant Health Progress doi:10.1094/PHP-2001-1029-01-RS. Douglas-fir are traditionally grown as Christmas trees in the Pacific Northwest (PNW). Intermountain (IM) provenances of Douglas-fir are less likely to be injured after harvest by exposure to subfreezing temperatures than the coastal provenances. However, planting IM Douglas-fir in the coastal areas of the PNW is currently not recommended because of their high susceptibility to Rhabdocline needle cast. During a three-year period, needle cast severity was rated (0 to 100 scale) on trees in a replicated planting of IM Douglas-fir near Puyallup, WA. In 1997, needle cast ratings ranged from 0.8 to 70. Trees from the Cibola National Forest (NF) had significantly higher needle cast ratings (70.0) than trees from Carson NF (17.3), Coconino NF (15.7), Rio Grande NF (5.0), and Upper Clearwater, ID (0.8). Trees from the Apache NF (51.4), San Isabel NF (32.3), two collections representing the Lincoln NF (25.4-30.2), and the Santa Fe NF (21.3) had intermediate levels of needle cast. This study shows that certain sources of IM Douglas-fir can be grown in the PNW with minimal Rhabdocline needle cast problems. Applications of chlorothalonil also provided effective needle cast control on all but the most susceptible provenance. Douglas-fir (Pseudotsuga menziesii (Mirb.) Franco) is commonly grown as a Christmas tree in North America. There are two recognized varieties of Douglas-fir, based on foliage color, cone form, growth rate, and environmental requirements (8). The coastal or “green” variety (var. menziesii) naturally grows from west-central British Columbia southward to central California. Its range is continuous from the Cascades and Sierra Nevada Mountains west to the Pacific Ocean (9,11). The intermountain, Rocky Mountain, or “blue” variety (P. menziesii var. glauca (Beissn.) Franco) is native to the inland mountains of the Pacific Northwest (PNW) and the Rocky Mountains from central British Columbia south to northern Mexico. Its range is fairly continuous from central British Columbia south to central Idaho and western Wyoming, but is restricted to certain locations in Utah, Nevada, Colorado, New Mexico, Arizona, extreme western Texas, and northern Mexico (7). Intermountain (IM) varieties of Douglas-fir Christmas trees tend to be grown in areas around the Great Lakes, northeastern states, and the “Inland Empire” region of Idaho and eastern British Columbia. The coastal areas of the PNW, which produce about one-third of the 36 million Christmas trees harvested in the United States (4), is the major area where the coastal variety of Douglas-fir is grown. Douglas-fir accounts for about 45% of the production (5.9 million trees) in this area and trees are shipped throughout North America and exported to a number of foreign markets. In addition to morphological differences, IM types of Douglas-fir are less likely to be injured by exposure to subfreezing temperatures, which are common in some markets, than coastal types (10). Currently, growers in the PNW avoid using IM provenances of Douglas-fir to establish plantations west of the Cascade Mountains because of their susceptibility to Rhabdocline needle cast, which is caused by fungal pathogens in the genus Rhabdocline (1,12,21). There are two species of Rhabdocline (R. pseudotsugae Syd and R. weirii Parker & Reid) with five subspecies that are pathogenic to Douglas-fir (6,12,16,17,21). In addition, R. parkeri (Sherwood, Stone & Carroll) has been reported as a common endophyte of Douglas-fir needles in the PNW (20). Douglas-fir and Bigcone Douglas-fir (P. macrocarpa (Vasey) Mayr.) are the only known hosts of these pathogens. Although not common on coastal types of Douglas-fir in the PNW, Rhabdocline needle cast can cause extensive damage to susceptible trees (18). In western Washington, needle infection takes place during shoot elongation (5). Symptoms first appear as very small yellow spots on current season needles as early as fall but usually become evident during the winter months. In early spring these discolored areas rapidly expand — sometimes to affect the entire needle — but usually areas are confined to small bands. At first these areas appear as a mottled yellow color but soon change to a brown to brick red (Fig. 1). As the apothecia mature below the epidermis, a slight swelling in this area is visible. In the PNW, the vast majority of fruiting bodies will develop on the underside of the needle. During early spring, a longitudinal split develops allowing the epidermal flaps to expose the orange-bronze surface of the fungal fruiting bodies (Fig. 2). Following spore release, infected needles usually are cast prematurely, leaving very susceptible trees with only the new, current year complement of needles. Fungicide applications during the spring are often used to control the disease on these susceptible trees (5,13,15). Fig. 1. Characteristic red discoloration of needles associated with Rhabdocline needle cast (click image for larger view). Fig. 2. Rhabdocline pseudotsugae subsp. pseudotsugae apothecia on the underside of Douglas-fir needles (click image for larger view). Because of the differences in postharvest characteristics between IM and coastal types of Douglas-fir, there is increasing interest in growing IM provenances of Douglas-fir in the PNW for specialized markets. Several studies outside the PNW have shown that there is considerable genetic variation in susceptibility of IM provenances of Douglas-fir to Rhabdocline needle cast (1,14,21). In 1991, a planting of commonly available IM provenances of Douglas-fir was established at WSU Puyallup to determine their susceptibility to Rhabdocline needle cast under PNW conditions and determine if there was any variation in the effectiveness of applications of protectant fungicides in controlling disease development on different provenances. A preliminary report on this work has been published previously (3). Plant material. Douglas-fir seedlings from nine different IM provenances ranging from New Mexico’s Lincoln NF in the south to Idaho’s Clearwater NF in the north were obtained from two commercial nurseries in 1991. The test also included seedlings from two collections, designated “a” and “b”, from the Lincoln NF. Seedlings were planted 3 feet apart within 10 rows that were on 6-foot centers during May, 1991. Pairs of seedlings from each source were randomly planted in each row. Additional trees from all of the sources, except Upper Clearwater and Lincoln NF (a), were planted in two adjacent border rows on the edge of the plot. After three years, the trees were annually sheared to form Christmas trees. Fungicide treatments. Starting in 1996, chlorothalonil (Bravo 720 in 1996 and Daconil WeatherStik in 1997 and 1998) at 1.3 g a.i./liter was applied to the new growth on half of the trees in the plot. Applications were made with a Solo backpack sprayer equipped with an 8003 LP nozzle at 15 psi. Two applications were made each year. The first application was made when there was 1/2 to 2 inches of new growth, followed by a second application 3 weeks later. At each application, the new foliage was sprayed to wet. The plot was a split plot design with a total of five blocks with sprayed and unsprayed pairs of trees from each seed source. Disease rating. Starting in 1996, needle cast severity was rated each spring using a 0 to 100 scale based on a modification of the Schreiner scale that is used to rate leaf rust on Populus spp (19). Ratings were done on April 18, 1996, April 22, 1997, April 17, 1998, and March 8, 1999. Shoots on the lower 2/3 of each tree were examined to find the shoot with the greatest extent of symptoms. The severity of symptoms on this shoot was rated on a 0 to 25 scale with 0 = none, 1 = slight, 5 = moderate and 25 = severe. The proportion of shoots on the lower 2/3 portion of the tree with similar symptoms was then rated on a scale of 0 to 4, where 0 = none, 1 = 1 to 25%, 2 = 26 to 50%, 3 = 51 to 75% and 4 = >76%. The disease severity rating for the tree was obtained by multiplying the shoot symptom severity rating by the whole tree rating. This resulted in potential disease ratings of 0, 1, 2, 3, 4, 5, 10, 15, 20, 25, 50, 75 and 100. Data analysis. After calculating an average rating for the pairs of trees for each provenance within each row, the data were subjected to analysis of variance using GLM SAS (SAS Version 8, SAS Institute Inc.). When the test statistics were significant, provenance means were separated using Duncan’s multiple range test. Means were also used to rank the susceptibility of each provenance between 1996 and 1999. Spearman correlations were calculated for these yearly rankings to determine if the ranking in 1996 was statistically the same as the ranking in 1997, etc. Observed disease severity and provenance resistance. Rhabdocline pseudotsugae ssp pseudotsugae Parker & Reid was the only Rhabdocline taxon detected on the trees during this study. Symptoms initially appeared on the trees during spring in 1996. At that time, disease ratings ranged from 0 to 20.8, depending on the provenance (data not shown). Between 1997 and 1999, trees from Cibola NF consistently had more needle cast than trees from any of the other provenances (Table 1). In addition, trees from the Carson NF, Coconino NF, Rio Grande NF, and Upper Clearwater consistently had the least amount of needle cast. Analysis of susceptibility rankings indicated there was a statistically significant correlation between all the yearly rankings (Table 2). In general, there was a higher correlation coefficient for rankings for years with similar overall disease pressure (i.e., 1996/1998 and 1997/1999). Table 1. Rhabdocline disease ratings on sprayed and unsprayed provenances of Douglas-fir grown near Puyallup, WA. 1. The disease severity ratings ranged from 0 (no disease) to 100 (severe disease on >75% of the needles in the lower 2/3 of the tree. 2. Two applications of chlorothalonil were applied to the trees during shoot elongation in 1996, 1997, and 1998. 3. Numbers followed by the same letter in each column are not significantly different, P = 0.05, Duncan’s multiple range test. Table 2. Spearman correlation coefficients for yearly susceptibility rankings between 1996 and 1999. Previous studies have shown that there is considerable variation in resistance to Rhabdocline needle cast. One study in Pennsylvania showed that trees from Carson DC and Santa Fe HGCC within the Carson and Santa Fe National Forests were more resistant than trees from 14 other locations in Arizona, New Mexico, and Colorado (14). Merrill et al. (14) also showed that there was a strong correlation with latitude of the source, with increasing disease ratings associated with increasing latitude. There are a number of differences between this study and the study in Pennsylvania. The most resistant trees in this study came from the most northern site, which was not included in the Pennsylvania study. Even though R. pseudotsugae ssp pseudotsugae was the cause of needle cast in both studies, the two sources of seed from the Cibola NF that were included in the Pennsylvania study had moderate levels of resistance, while the Cibola NF trees in this study were the most susceptible. Previous studies have shown that there can be significant differences in the susceptibility of different collections of seed from within the large geographical areas covered by National Forests, which may explain the apparent differences between these two studies. As observed in other studies, there was considerable tree-to-tree variation in susceptibility within all of the provenances included in this test. Three quarters of the trees from the upper Clearwater provenance never developed any needle cast. The percentage of trees from the other provenances that never developed needle cast symptoms ranged from 6.7 to 33.3%. Even within the highly susceptible Cibola NF provenance, there were highly resistant individual trees that never developed needle cast during this trial (Fig. 3). Tests are underway to determine if molecular probes can be used to distinguish between sensitive and resistant trees (2). Fig. 3. Rhabdocline susceptible (left) and resistant (right) trees from the Cibola National Forest (click image for larger view). Fungicide effectiveness. Applications of chlorothalonil provided effective needle cast control on all but the most susceptible provenance (Table 1). This study suggests that certain sources of IM Douglas-fir can be grown in the PNW with minimal Rhabdocline needle cast problems and that applications of chlorothalonil to the new growth in the spring to control this disease can be effective. However, this study also shows that even when sprayed, the levels of needle cast on the highly susceptible Cibola NF trees were much higher than on trees from the other provenances (Table 1). Some Christmas tree growers in the PNW are utilizing rooted cuttings to establish plantations. Given the tree-to-tree variation in susceptibility to needle cast even within the most susceptible sources, it should be possible to identify individual trees with superior phenotypic characteristics, including resistance to Rhabdocline needle cast, and propagate these as rooted cuttings. Additional work is also needed to confirm that IM Douglas-fir that are grown in the PNW still exhibit superior postharvest characteristics, particularly in relation to cold hardiness. Plant Pathology New Series No. 0326, Department of Plant Pathology, College of Agriculture and Home Economics, Washington State University, Pullman 99164-6430. The Pacific Northwest Christmas Tree Association supported portions of this work. The donation of seedlings by Fantasy Farms Nursery and the assistance of John Staley, Valerie McQuarrie-Baker, and Kathy Riley are gratefully acknowledged. 1. Brandt, R. W. 1960. The Rhabdocline needle cast of Douglas-fir. Tech. Publication No. 84. College of Forestry, Syracuse University, Syracuse, NY. 2. Catal, M., Adams, G. C., and Chastagner, G. A. 2001. Detection, identification and quantification of Rhabdocline infection in symptomless foliage of Douglas-fir. Phytopathology 91S:13-14. 3. Chastagner, G. A. 2001. Susceptibility of intermountain provenances of Douglas fir to Rhabdocline needle cast. Phytopathology 91S:182. 4. Chastagner, G. A., and Benson, D. M. 2000. The Christmas tree: Traditions, production, and diseases. Online. Plant Health Progress doi:10.1094/PHP-2000-1013-01-RV. 5. Chastagner, G. A., Byther, R. S., and Riley, K. L. 1990. Maturation of apothecia and control of Rhabdocline needle cast on Douglas-fir in western Washington. Pages 87-92 in: Recent Research on Foliage Diseases. W. Merrill and M. E. Ostry, eds. Gen. Tech. Rep. WO-56. USDA Forest Service. Washington, DC. 6. Ellis, D. E., and Gill, L. S. 1945. A new Rhabdogloeum associated with Rhabdocline pseudotsugae in the southwest. Mycologia 37:326-332. 7. Hemstrom, M. A., Logan, S. E., and Pavlat, W. 1987. Plant association and management guide: Willamette National Forest. R6-Ecol 257-B-86. USDA Forest Service, Pacific Northwest Region, Portland, OR. 8. Hermann, R. K. 1982. The genus Pseudotsuga: historical records and nomenclature. Special Publication 2a. Oregon State University, School of Forestry, Forest Research Laboratory, Corvallis, OR. 9. Hermann, R. K., and Lavender, D. P. 1990. Pseudotsuga menziesii (Mirb.) Franco Douglas-fir. Pages 527-540 in: Silvics of North America. R. M. Burns and B. H. Honkala, Technical Coordinators. Volume 1. Conifers. Agric. Handb. 654. USDA Forest Service, Washington, DC. 10. Kubiske, M. E., Abrams, M. E., and Finley, J. C. 1990. Keepability of Pennsylvania versus West Coast Grown Douglas-fir Christmas trees: genotypic variation in relation to subfreezing temperatures. Northern J. Appl. For. 7:86-89. 11. Little, E. L., Jr. 1979. Checklist of United States trees (native and naturalized). Agric. Handb. 541. USDA Forest Service, Washington, DC. 12. McDowell, J., and Merrill, W. 1985. Rhabdocline taxa in Pennsylvania. Plant Dis. 69:714-715. 13. McCullough, D. G., Katovich, S. A., Ostry, M. E., and Cummings-Carlson, J., eds. 1998. Christmas tree pest manual. Second Edition. USDA Forest Service and Michigan State Univ. Ext. Bulletin E-2676. 14. Merrill, W., Wenner, N. G., and Gerhold, H. 1990. Rhabdocline needle cast resistance in Douglas-fir seed sources from the southwestern United States. Pages 93-95 in: Recent Research on Foliage Diseases. W. Merrill and M. E. Ostry, eds. Gen. Tech. Rep. WO-56. USDA Forest Service, Washington, DC. 15. Morton, H. L., and Miller, R. E. 1982. Chemical control of Rhabdocline needle cast on Douglas-fir. Plant Dis. 66:999-1000. 16. O’Brien, J. G., and Morton, V. H. 1983. Occurrence of Rhabdocline taxa in Douglas-fir tree plantations in Michigan. Plant Dis. 67:661-663. 17. Parker, A. K., and Reid, J. 1969. The genus Rhabdocline Syd. Can. J. Botany 47:1533-1545. 18. Scharpf, R. F. 1993. 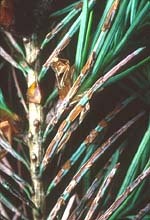 Diseases of Pacific Coast Conifers. USDA Forest Service Agr. Handbook 521. 19. Schreiner, E. 1959. Rating poplars for Melampsora leaf rust infection. USDA Forest Service, N. E. Res. Notes 90. 20. Sherwood-Pike, M., Stone, J. K., and Carroll, G. C. 1985. Rhabdocline parkeri, a ubiquitous foliar endophyte of Douglas-fir. Can. J. Bot. 64:1849-1855. 21. Stone, J. 1997. Rhabdocline needle cast. Pages 54-55 in: Compendium of Conifer Diseases. E. M. Hansen and K. J. Lewis, eds. The American Phytopathological Society, St. Paul, MN.